I'm all about exfoliating... I do it regularly and often because if I don't, my skin is dull, dry and flaky. That said, I can't use exfoliating methods that are too rough because my skin is ever-so-slightly sensitive and something too aggressive will leave my face red, blotchy and irritated. Nu Skin Exfoliant Scrub is suitable for all skin types and I've been using it regularly for a few weeks. It's my new favorite product for a few reasons. First of all, it's minty, which feels cooling, reviving and tingly on my tired, sleepy face first thing in the morning. It's like a breath of fresh air. Also, this scrub has a thick, creamy consistency, so much so that the first time I used it I was a little confused by it thinking that something so luxurious wouldn't be much in the way of a scrub, but I was wrong. The scrubbies aren't visible as in other exfoliating products, but they're in there and they work! With an aloe vera base, Nu Skin Exfoliant Scrub doesn't dry out my skin like some other exfoliators I've tried in the past. After using it, my skin is soft, smooth and radiant. The dead skin is sloughed off, but it's not irritating in the least. I am even able to use this on days I don't wear make-up which is quite rare for me with exfoliators because my skin is so sensitive to scrubbing that it usually looks red afterwards, but not with this product. 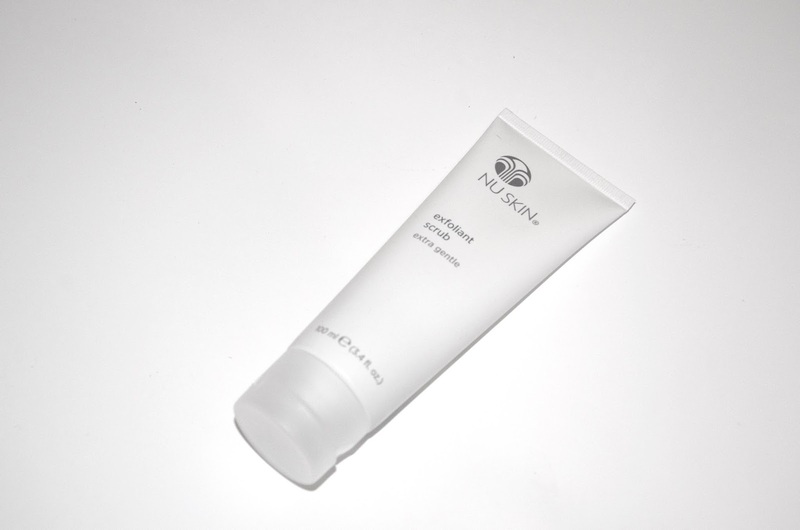 Nu Skin Exfoliant Scrub is £18.62 online and available from Nu Skin. I love reading your blog. Glad that you love Nu skin products. Email me if you would like to get a discount from Nuskin website.